Every year, around May or June, I begin to yearn for Christmas. The holidays always feel magical to me, and doubly so when they are so far away and the summer doldrums are about to kick in. There’s a certain anticipation that just builds and builds as the year wears on. I long for the music and the cheer, the lights and the cookies and the blazing fire in the hearth, Clark Griswold and Buddy the Elf and George Bailey realizing that he’s the richest man in Bedford Falls. But the actual season almost never lives up to its early promise, usually turning into a busy blur of commitments instead. I feel like I’m so busy crossing items off the to-do list, I hardly have the time to actually stop and enjoy them. The holidays turn into a whole bunch of “gottas” instead. Gotta mail the cards. Gotta buy the gifts. Gotta plan the meals. Gotta watch The Grinch. And then one day the whole thing is over and I’m left wondering where Christmas went. Next year will be different, I say to myself every December 26th, vowing to focus on the present rather than the presents the next time around. I tell myself I will “be” instead of “do,” that I will savor each moment as it unfolds instead of being in such a damn hurry to move on to the next thing on my mental checklist. How very Zen of me. Very rarely do I succeed, but this year was better than most. True, our cards didn’t get mailed until a couple of days before Christmas – some of our family and friends are probably just now receiving theirs – and we never did get around to our annual dinner at The Rheinlander. But I had a lot more spirit in 2015 than I did last year, no doubt because I felt much more “normal.” One year ago my health was deteriorating and I was days away from a hospital stay, though I did not realize it at the time. As a result, I was more determined than ever to make the holiday season count, because I realized you can never take anything for granted. Corny, but true. Things were different this year. My aunt in Newberg usually has us over for Christmas Eve but she was out of town, so Tara and I did our own take on the Russian feast she usually puts together. Tara’s pelmini turned out delicious and my stuffed cabbage soup was a surprise hit. My parents and son joined us for that, and we turned around the next day and went to their house for prime rib, mashed potatoes, green beans, and cheesecake. Initially my mom wasn’t going to bother with the dessert, reasoning that I wouldn’t eat any, but diabetic-in-remission or not, there was no way I was missing out on cheesecake. Sugar be damned, that’s a once-a-year treat worth the splurge. As far as gifts go, I got Tara a lens for her new camera and some markers for her adult coloring books; I ended up with a whole bunch of clothes that actually fit and a BluRay copy of the Kurt Cobain documentary Montage of Heck, which is freakin’ fantastic, by the way. And a generous Amazon gift card from my folks. I am seriously thinking about getting a new camera myself; there’s a Nikon that I’ve got my eye on, and now that I’ve seen how awesome Tara’s DSLR is, I’d love to take my photos to the next level, too. Still mulling that one over. Which is Markspeak for I’ll pretend to mull it over for a few days, weighing the pros and cons, but have really already made my mind up and it’s only a matter of pulling the trigger. Yesterday Tara and I drove out to McMenamin’s Edgefield to catch the new Star Wars movie. Like everybody else in America we’d been dying to see it, and when Tara suggested doing so in the Power Station Pub, I was all in. There is nothing like being whisked to a galaxy far, far away while enjoying a Bloody Mary and cajun tater tots from the comfort of your theater chair. I’d been judiciously attempting to avoid all spoilers and, while not completely successful in this endeavor, still liked the movie a lot. It’s the perfect blend of action and nostalgia, new characters and old, and they did a great job of capturing both the look and feel of the original series while updating it for the 21st century. Today we are planning to un-Christmas the apartment. It’ll be another short work week; we are headed to Ely to celebrate both New Year’s and Tara’s grandparents’ 60th anniversary, leaving Wednesday afternoon and returning on Sunday. I was hoping for snow and while it doesn’t look like we’ll see any falling from the sky, there will be plenty on the ground and it will be cold. The temperature in Ely this morning is -12. As in, twelve below zero. I don’t think my body can handle such cold weather anymore, seeing as how I’m usually freezing if it drops below 60 these days. Too bad Santa didn’t leave any longjohns in my stocking! Movies at the Power Station are the best! That was our first time there, but I’ve gotta say, it won’t be our last. Loved it! I think I like the Kennedy School a little better, only because of their plush couches and overstuffed chairs. Anyplace I can watch a movie while drinking a Bloody Mary is A-OK in my book! I’m the opposite of you. I’m not a big fan of the holidays. Probably because of all the work. I’ve hosted three big holiday meals for relatives and still have two more to make before it’s all over January 2nd. I’m always longing for the lazy, hazy, carefree days of summer. Good grief on the negative temps! See, Tara and I enjoy hosting, which is probably one of the reasons why I love the season. I feel like it gives us a chance to show off our culinary skills. The stuffed cabbage soup was a brand new recipe (thanks, Pinterest!) and my parents raved over it. I think it might become a new Christmas Eve tradition, even if we are not hosting next year. Bundle up! Buy some hand and feet warmers if you can, those suckers are great. Enjoy Ely! Sounds like despite hecticness, you had a good christmas. So did we. I’ve never been more behind and worked so closely to the wire, but hanging out with family was good. Also, after reading your post, I’m thoroughly hungry. Thanks! Sure, there was lots of good food, but the holidays were sadly geoduck-free. Maybe next year we can make that a new tradition! Mark, I felt EXACTLY the way you did this year when it came to Christmas. Not that I didn’t feel the Christmas spirit in prior years, because I did. However, this year was extra special. And (like you last year) I went through a serious health challenge this year, which caused me to see things differently. I felt extra grateful this year, and I’m sure you can identify with that. Yup…I know what you mean by that. I love the holidays even though I’m in retail. So many of the people I work with were very grumpy this year; wishing that the season would pass quickly. I on the other hand was savoring it; not wanting it to ever end. 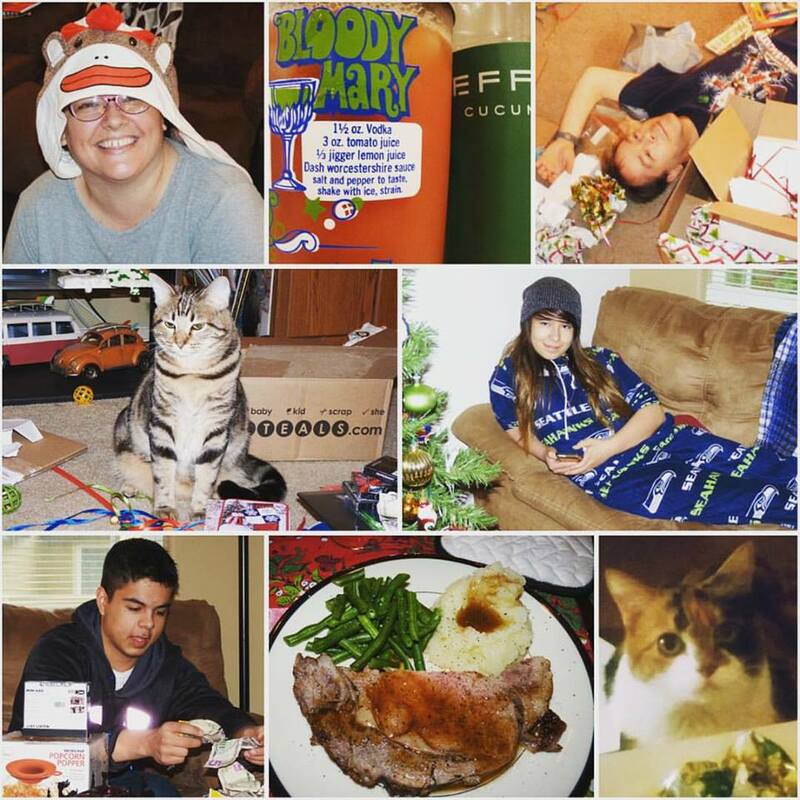 Sounds and looks (judging from your photo collage) like you had a faaaaaabulous Christmas! I especially love the photos of the cats! You GO, boy! You’ll really enjoy it. I am sooooo glad I move up to a DSLR! Have a great time in Ely this weekend. And please send me some of that cold weather and snow. It’s still so very warm here. Ron, if your photos are any indication, the DSLR is a worthwhile investment for a budding amateur photographer! So glad I pulled the trigger and ordered it this morning. TOLD YOU it was already a done deal! Now is probably not the best time to tell you it SNOWED here yesterday! Nothing stuck on the ground, but it looked beautiful falling from the sky for a couple of hours in the afternoon. Hope it cools down for you guys soon – I hear relief is on the way.